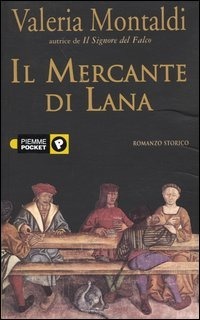 Il Mercante Di Lana (The Wool Merchant) is the first of a series of historical novels, set in the Middle Ages, that narrates the adventures of Father Matthew, an English monk who was kicked out of his monastery for helping to hide a woman accused of witchcraft. During his peregrinations, Father Matthew has a vision. God wants him to turn his steps to Felik, a small village in the Alps, to save its inhabitants, most of which are rich merchants. Money and success have gone to their heads and hardened their hearts, and if they won’t repent and change their ways, God will punish them. It is Matthew’s adventurous and the daily life at Felix that makes up most of the book. The monk arrives at Felix only towards the end of the novel, and the inhabitants have very little time to decide whether to listen to his words or not. Maybe this is the reason why I couldn’t really get into this book. To me, more than a historical novel, The Wool Merchant sounds like an essay written in a novel form, a way for the author to showcase her knowledge of every aspect of daily life in the Middle Ages and of the walser people (the inhabitants of Felix belong to the walser community). As interesting as all these detailed information is, the book is not a page turner. There are too many characters, and most of them interact only with the monk, so when he proceeds on his journey leaving them behind, they just disappear from the narration. Their only reason for being is that the author seemed intent on including every type of person that you could have encountered in the Middle Ages, from a rich vassal to a poor robber, from a prostitute to a servant. Once their roles and duties are explained to the reader, they aren’t needed anymore. Another thing that put me off is the dialogues, although I should probably say monologues. All the characters, from the poorest and most ignorant servant to the richest and best-educated vassal, make very long speeches. You ask them a question, they will tell you their whole life stories, which just isn’t believable. No one talks like that in real life, not now, not centuries ago. Even less believable is that all these monologues are uttered in perfect Italian (or whatever other language you’re reading the book in; I have the Italian edition obviously). Grammar is always perfect, long and refined words are used, and the tone is almost always formal. Even the poorest characters never use contractions or dialectal expressions. Still, as a first effort, The Wool Merchant isn’t bad. The author needs to learn that there is no need to include a pletora of facts that have nothing to do with the main storyline, and that subplots must have a point that’s not simply that of showcasing her historical knowledge of the period and the walser people (although if she wrote an essay about that, I’d buy it in a heartbeat as Montaldi obviously knows what she’s talking about). Character development needs to be improved too, but overall, the story is nice and well-researched, it raises interesting questions and it will also teach some moral lessons. The Wool Merchant is a historical novel set in the Alps in the Middle Ages. Father Matthew needs to go to Felix to warn the inhabitants that something bad will happen to them if they don’t stop being so selfish and proud. Along the way, he has lots of adventures and encounters lots of different people. Although the story is well-researched, it seems its only purpose is to showcase the author’s knowledge of this era and of the walser community, an aim that would have been better achieved by writing an essay. In addition, the long, formal and proper way in which all the characters talk is not believable. Still, I recommend it to those who want to know more about the Middle Ages and the walser people.